Do you remember the art of the mix tape, or mix CD? Did you carefully study your music collection to find just the right song to express your feelings to a new crush? Did you sit by the radio, waiting to hit RECORD at just the right moment to catch that elusive song to add to a collection, the one that perfectly summed up your summer, but which you didn’t have money to buy the album? You were curating content. Librarians, archivists, knowledge managers, and other info pros are the original content curators. Many of us have graduate degrees or coursework in how to build excellent, really useful, engaging collections of content. We know our patrons and users could never read or use everything in our collections – so create displays of materials to bring attention to new authors or hot topics; we create guides to find resources inside databases; we provide RA and recommend new authors to patrons. I love that someone said librarians are becoming “knowledge flow facilitators” – though I’d say we always have been! We didn’t create the archival records, but we process them and make them accessible for research. We didn’t create the paintings, the books, or the artifacts – but we collect, organize, and explain them. All those LibGuides you’ve created (everything from Zombies, to Cheesemaking, to Healthcare Reform) the resources lists in specific subjects for college students, the guides to healthcare, etc. Libraries don’t throw books on the shelf willy nilly, or put together random, ad hoc selections of materials based on whims. We’re not primarily authors, but we ARE curators. We always have been. We’re the ones who teach others how to curate! 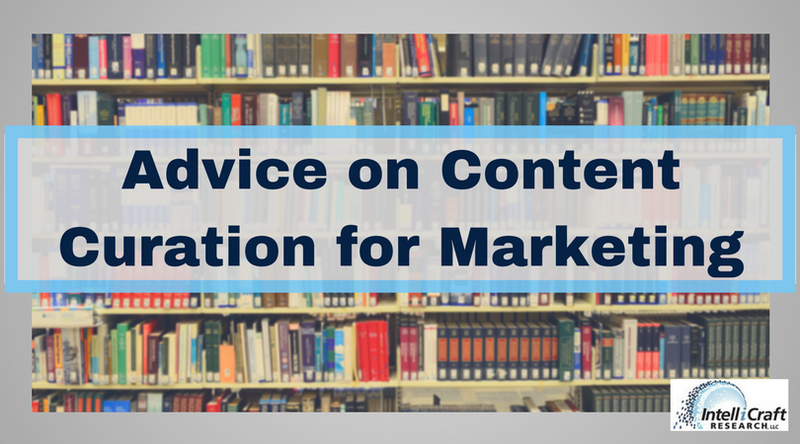 But are you using your content curation skills in your marketing efforts? If library professionals totally GET curation, why do we feel we need to create 100% of our marketing efforts from scratch, as if we were artists, authors, illustrators or others who create the materials that make up collections? I don’t think we’re using content curation in our marketing efforts – and that’s a shame, and a waste of a good strategy. Does your library include those guides and resources lists in the material you share on social media? Do you actively promote use of your curated online resources? How do you talk about all your awesome, well-crafted selections and curated content? Do you stress how the role of the library as a careful selector helps its community? Good content curation can help boost your brand and perceived value among your audience and loyal users. It can grow your exposure, as sharing on social media lets you reach your audience AND the audience of whatever expert/org/brand you’re curating. It’s really the backbone of many social shares and interactions these days – but if we’re more intentional and strategic about it, it makes for good marketing. I Need to Practice Better Content Curation in MY Marketing – Hold Me Accountable! And hey, I’m including myself in the shaming here – I know all about content curation as a marketing technique, but over the years my curation efforts have been hit or miss, in waves and droughts. So, I’m making a renewed commitment to curation and inviting you to go along with me. I’ll share more marketing tips, resources, research, trends reports, and thought pieces from experts I respect -and hopefully add in my own commentary or thoughts as I go. It’s a natural way for me to continue to be a go-to resource for you, my library marketing colleagues, and to save you the time of tracking all this down yourself. And … to practice what I want to teach …. I’ll be curating some good resources on this very topic, not writing all of it myself. While I certainly studied Collection Development and Resources in … (nearly every major subject category) in LIS school, I’m still not the top expert on this. And I’ve let my content curation for marketing skills slide a little – so I’m doing a challenge to boost my skills (still time to join me!). But I I know how to find and share great advice from others and to share it those are interested in the same topic. Hmmm, sound familiar library pals?! Do be discerning in what you pick to curate and share; do use tools like news aggregators to help you find and sort good material to share; and always give credit. Great tips from WiredImpact for more than just nonprofits to leverage curation. Nonprofit tech and marketing experts Tech Soup support content curation as an additional way to raise visibility and educate the greater public about your cause or nonprofit mission. And finally, here are 31 experts on content marketing, all answering the question “What’s your #1 tip for effective content curation?” as a part of a marketing strategy. Anything that mentions that curation is ‘hands-off’, or can be completely automated, ‘set it and forget it’. Advice that that promises tons of traffic flowing magically to your website with no work on your part after the original curation of content. Just share the first links you find on a topic – they must be hot and worthwhile, they’re at the top of the search results. You don’t need to read all the articles or resources you curate – the website is well known and trusted. Get going right away, copy & paste things and just hit ‘publish’ or ‘share’ direct to social media. You don’t need a plan or a schedule. Anyone telling you NOT to share a post or website because it’s already popular and so everyone will have already seen it. Maybe they haven’t all seen it. And they haven’t heard why YOU think it’s worth sharing. No, no, no, no. But you already know that’s all bad advice, right?! Basically every social media management and scheduling tool [Hootsuite, Buffer, Social JukeBox, CoSchedule, AgoraPulse, SproutSocial, etc). And Pinterest – Pinterest is 100% curation; there’s no original content there, it’s all saving ideas of crafts, recipes, home renovations, school bulletin boards, as first created and posted by some other site. Ok, there are other tools too: automated newsletter creators (Nuzzel, Scoop.it, Paper.li) and news aggregators (Feedly, Flipboard), link savers (the new generation of bookmarking tools) like Pocket, the late, great Storify, and many others. You can read this post of curation tools, from a social media and curation tool itself, Curata. And I like that at least one of my favorite resources for good advice on content marketing gets the librarian as ultimate curator analogy too – thanks CoSchedule! Check out their post on scheduling social media and building in curated content (admittedly easier with tools like theirs!). 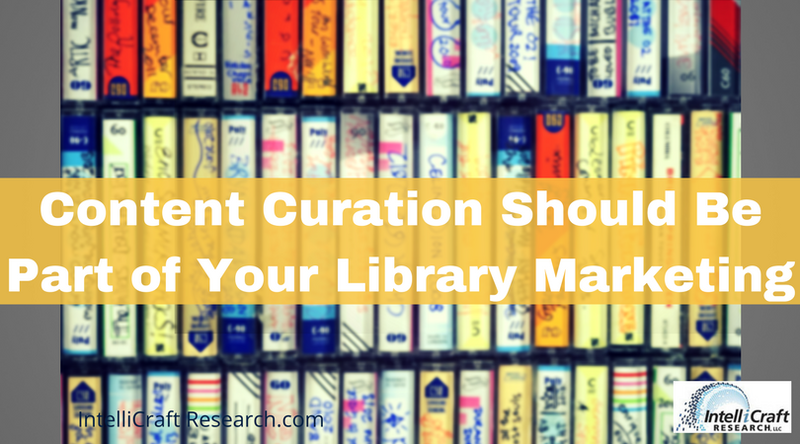 Show Me Your Library’s Content Curation for Marketing! Got a comment and question about curation and the mechanics of how to do so via Twitter from a library colleague. So I made a video to show how I do things. I hope this helps! Want more tips from other marketing experts like these? Be the first to hear about training offers, blog posts, and the marketing research I curate just for you! Sign up to hear from me. ​Library marketers and outreach pros - want the latest in marketing news without having to do the research? Great, I'll do the work and send you tips, trends, and invites for more training. Piece of cake!